Republican Presidential Candidate Carly Fiorina could never have predicted that she would be the focal point of a memorable moment at Hillary Clinton's New Hampshire Town Hall with Veterans, but that's what happened when one male questioner said he'd been laid off by Fiorina. He said, "I worked for Hewlett-Packard when Carly Fiorini was CEO. Then she laid off over 40,000 people. And she says she's a great CEO. Every time I see her on TV I want to reach through and strangle her. I know that doesn't sound very nice but… I wouldn't mess with you. Audience/Hillary laugh." "...Hillary Clinton and the Democrats have lost all credibility claiming to be a party that stands up for women. Jokes about committing acts of violence against women are always in poor taste and should be condemned every time." Clinton supporters at the event were more focused on her plan for Veterans which calls for a "new culture of accountability." Hillary Clinton Files Primary Paperwork in N.H.
Edward Raupp of North Hampton said, "She was on target in a way that none of the other candidates could ever be. Suzanne Howe of Derry said, "I thought her plans for the veterans were spot on. Which is very encouraging for me." Hillary Clinton's proposals were well received among veterans who came out to see her in Derry, but Republicans are painting a different picture of Clinton as being out of touch with the needs of veterans and the problems at the VA. 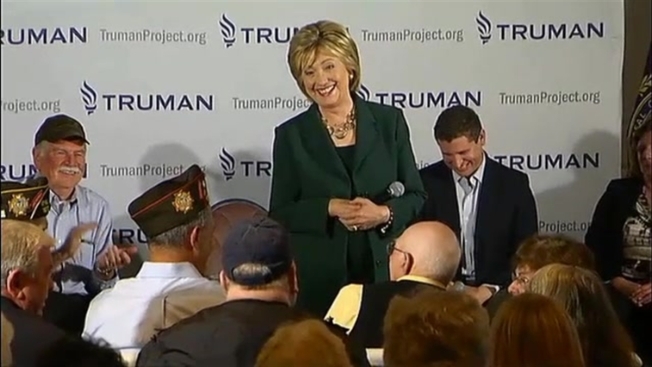 They point to a recent interview where Clinton said this about the Department of Veterans Affairs: "It's not been as widespread as it's made out to be…"
Clinton has her own criticism of what she describes as the republican plan for Vets. Clinton said, "As we work to improve the VA, I will fight as long and hard as it takes to prevent Republicans from privatizing it as part of a misguided, ideological crusade. Clinton was also asked if she would support a declaration of war agaisnt radical islamic terrorists. She said she would not, adding that if you have a declaration of war, "You'd better have a budget that backs it up."